In the past 2 lessons in this basic guitar chords series, we've learned the elementary major and minor open position chords, down at the first few frets. But it doesn't stop there! Now that we know the basic major and minor forms, we can modify these to create more interesting chords. In this lesson we're looking at the open 7th chords. Don't worry about what the "7th" means right now - in time you will understand. The main thing to know is that 7th chords are not separate from major or minor chords, rather they add notes to those basic major and minor chords. In other words, 7th chords are still essentially major or minor. Dominant 7th chords are used in place of regular major chords when the mood fits. There's no hard and fast rule, but dom-7th chords generally give the major chord a more unstable feel, and all because of one additional note, known as the flat 7th. 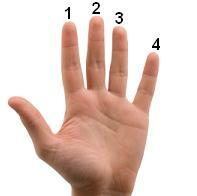 You can tell a chord is a dominant 7th chord because it will be written with a 7 (e.g. E7, D7, C7). Click the diagrams to hear the chord. 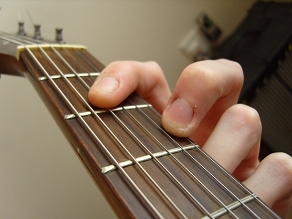 Use your index finger flat across the D G and B strings. Make sure all strings sound cleanly when fretted. Now we're modifying the basic minor chords to become 7th chords. Like above, adding the same flat 7th note gives the minor chords a fuller sound. It's just an easy way to beef up those regular chords. 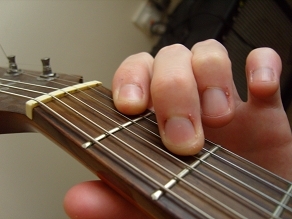 Try using your first (index) finger flat across those top 2 strings, making sure each note in the chord sounds cleanly and in harmony. Not to be confused with the dominant 7th chords from earlier, which were major chords with the added flat 7th. After 3 lessons of chords, we now have a fairly large pot from which to pull a simple progression of our own. Use the below jam track exercises to get an idea of how 7th chords can work with the other open chords we learned to create meaningful music. Note: Just like in the previous lessons, before you play over the jam track below, use a metronome to gradually build up your speed and confidence with changing chords. Make sure the changes are smooth and clean before you speed up a notch. Also, as always with these lessons, try making your own sequence from the guitar chords we've learned so far. The more you practice changing between chords, the sooner you will be ready to move on to using more advanced chord fingerings. However, don't feel like you're in a rush. Try playing along to different drum tracks to help practice your chord changes in a practical context. Think back to when you'd just learned the first couple of chords. Now look at how far you've come! You may even be at the point where you can just pick up the guitar and improvise with the chords you've learned. Whatever stage you're at, these lessons are always here for you to back track through and refresh your memory. In the final lesson of this open chord series, we will be looking at even more interesting chords you can create simply by modifying the basic major and minor open shapes. You may have experimented already by adding and removing fingers/notes to chords and changing their sound. Next lesson will build on this.